Modified-live, attenuated infectious bovine rhinotracheitis (IBR) hybrid virus vaccines have been constructed by inserting in the major IBRV glycoprotein g III gene chemically synthesized deoxyribonucleotide sequences encoding the bovine growth hormone signal sequence and monomeric or dimeric forms of the foot and mouth disease virus (FMDV) VP 1 epitope sequences. The foreign DNA sequences were inserted at the N-terminal end of the IBRV g III coding sequence and were driven by the IBRV g III promoter. The sequences encoding the first 38 and the first 21 amino acids of the IBRV g III were deleted from the hybrid viruses containing inserts of the monomeric and dimeric FMDV epitope sequences, respectively, to avoid redundant signal sequences. Plaque immunoassay experiments with guinea pig and bovine anti-FMDV peptide antisera, and with anti-IBRV g III monoclonal antibodies demonstrated that IBRV-FMDV fusion proteins were expressed in virus-infected MDBK cells. Immunoelectron microscopy analyses demonstrated that the IBRV-FMDV fusion proteins were expressed as repeated structures on the surface of virus particles. 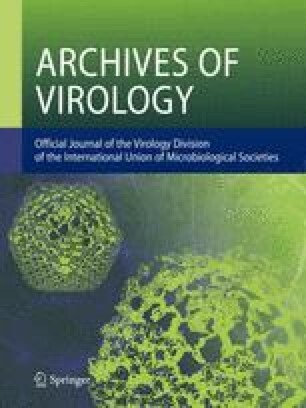 Experiments showed that the recombinant IBRV-FMDV viruses protected cattle from IBRV (Cooper) challenge and induced anti-FMDV peptide antibodies, thereby demonstrating that the FMDV epitopes were expressed in vivo.